We have added a new range of Ellutia products to our assortment. World of Technology & Science and Industrial Processing 2018 will take place from Tuesday 2 to Friday 5 October 2018 in Jaarbeurs Utrecht. The World of Technology & Science and Industrial Processing trade fairs are integrated into one exhibition: World of Technology & Science 2018. 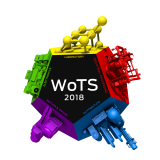 WoTS consists of five generic titles: World of Automation, World of Laboratory, World of Motion & Drives, World of Electronics and Industrial Processing . Are you coming along?